When it comes to decorating a nursery, the cot is everyone’s favourite starting point. But there’s one other thing every nursery needs. 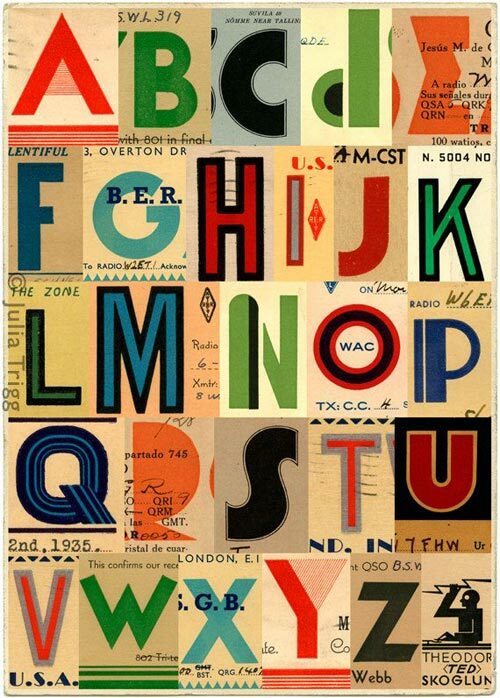 Of course, I’m talking about the ubiquitous alphabet poster. 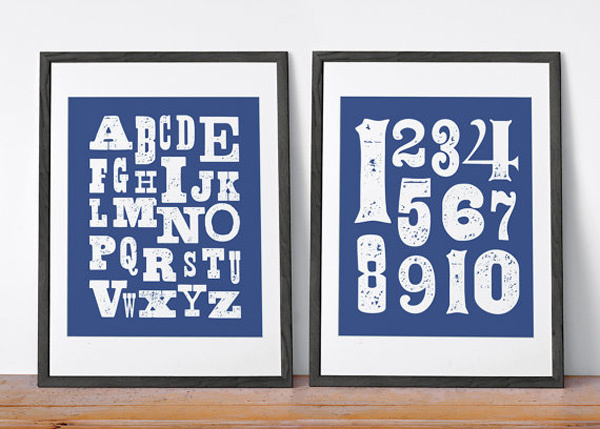 Here are our pick of the best alphabet nursery prints from Etsy. 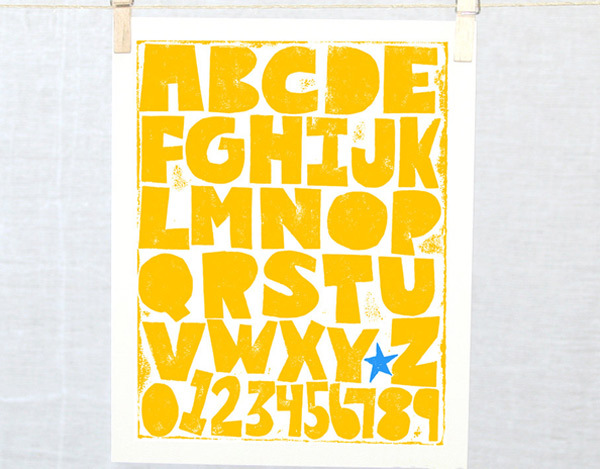 There’s something very cheery about a yellow alphabet poster, though this one’s no ordinary A-B-C. Handprinted on archival paper using hand-drawn and hand-cut letters, it’s made by a professional printmaker with a superb eye for typography. I adore the yellow, but you can chose any colour you like from Raw Art Letterpress. The print, unframed and unmounted, costs $23 plus $14 post. 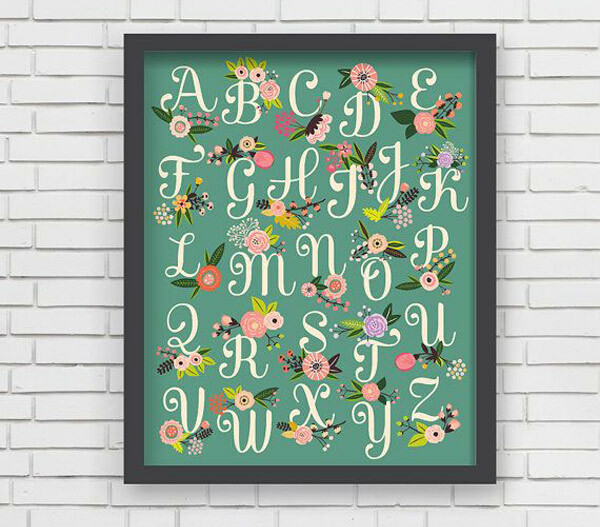 Imagine this Floral Alphabet poster in a very girly, vintage inspired nursery. Beautiful, yes? A generous poster size, it is printed with a gloss finish and costs $47 plus post from Lucy Darling Art Prints. 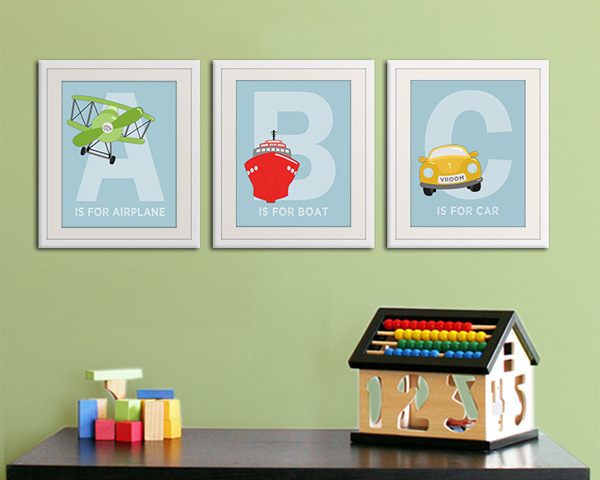 Transport is always a popular nursery theme for baby boys and here’s a bit of alphabet wall art to match. 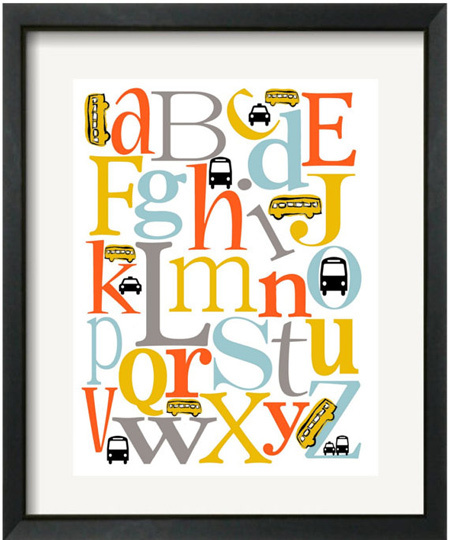 The Transportation Alphabet poster is priced from $11 to $26, depending on the size you choose, from Area Fare Kids. It is printed with archival inks on photo paper and you can customise the colours to match your own decor if you like. There’s something very boyish too about this alphabet and number set from Echo Bravo Charlie. A vintage woodblock style alphabet, this one comes to you as a DIY printable. Zap it out at home on your own printer or order it super-sized and have it printed somewhere like Officeworks or similar. It costs $13 for the alphabet poster and matching number poster. 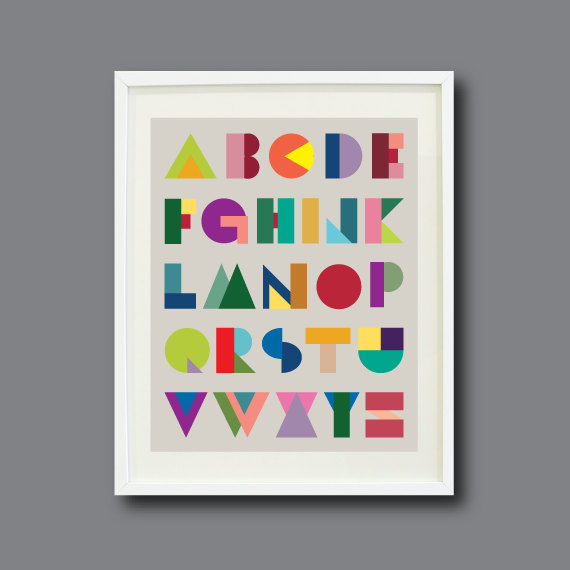 Or go delicately pretty with the ABC poster in pastel shades from Brixton Paper Shop. It costs $18 for a small unframed print, plus post. Bigger sizes are available too if you have a lot of nursery wall space to cover. 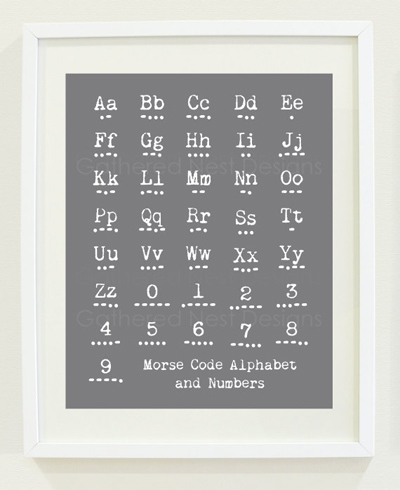 Don’t even get me started on how much I love this Morse Code alphabet print from Gathered Nest Designs. Something very different, it’ll keep your kid company from babyhood well into their teen years and costs $22. 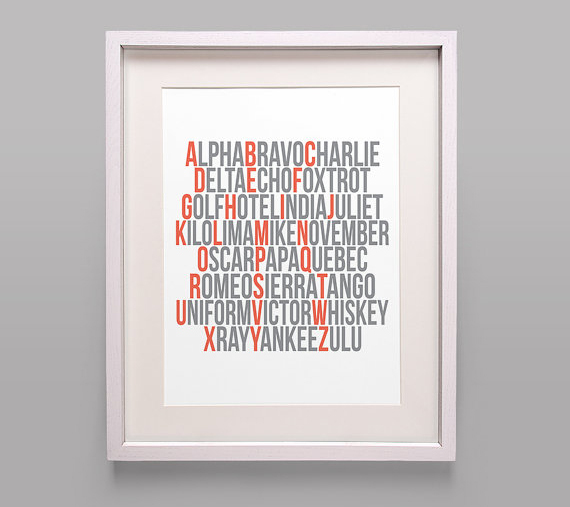 Little aviators might take a fancy to the aviation alphabet that’s on display in this NATO Phonetic Alphabet print. It goes from Alpha, Bravo, Charlie all the way to Yankee Zulu. Fabulous! Again, this is an art print that can keep its place on the wall long after your baby hits their stride as a tween – perhaps even until they earn their real pilot’s wings! It costs $15 plus post from Addison and Lake and can be ordered in any colour combination you like. For a vintage themed nursery, this limited edition art print could be just the thing to make a decor statement. A giclee print, all stunning art deco styling and genuine 1930s signal typefaces, the vintage signal print will set you back $288 from Julia Trigg. 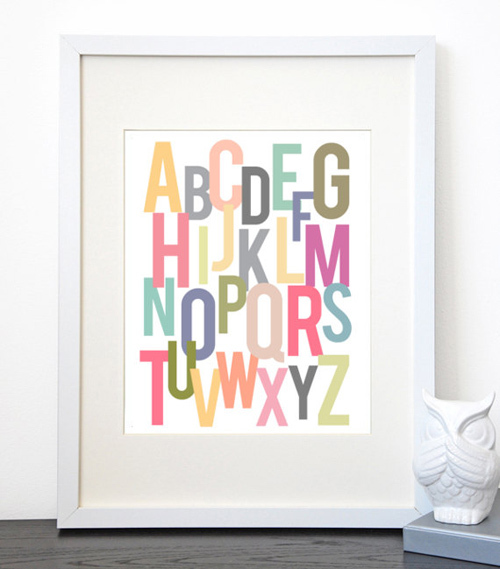 If happy and bright is the order of things in your nursery, then this is most certainly the alphabet art for you. 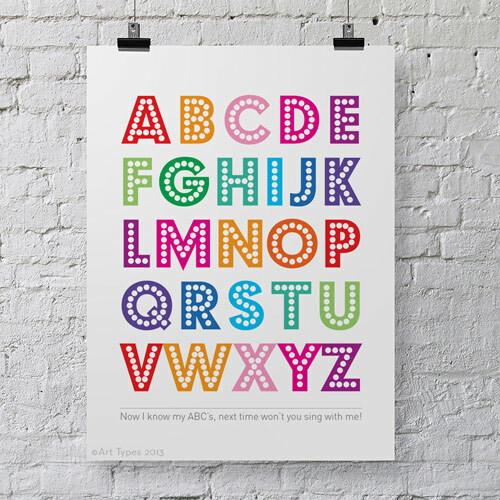 Ready to slip into an A3 sized frame, the Colourful Rainbow Alphabet Poster costs $20 plus shipping from Sydney’s ArtTypes. How about a bit of modern geometrics? That’s what you get with this stupendous Geometric Alphabet Print. The kids are sure to be fascinated with how simple triangles, circles and squares can create letters. It’s $29 from Gathered Nest Designs. I’ll finish where we started – with those fun set of A-B-C prints you saw at the top of this post. This trio of prints with their graphic transport theme that is just right for the nursery or play room can be customised in whichever colour you like. You can get all three for a mere $37 at the aptly named Wall Art for Small Fry. So there you have it. 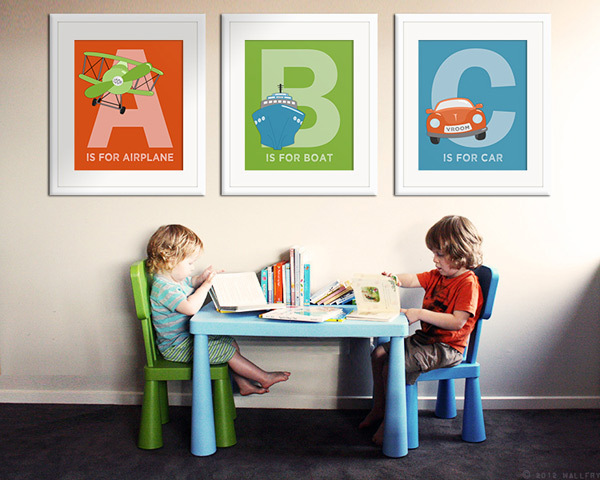 A list of 12 amazing alphabet prints for kids’ spaces. Take a look through our archives for more alphabet finds for your nursery.